Hi, every one. Welcome to Million AI School. I am Richard Shinn, the organizer of this meetup and also the CEO of AIBrain. Very nice to meet you all, while I am attending remotely from Palo Alto, California. Our grand goal is to build a million AI boutiques by 2030. Of course, it is not easy! However, it is our hope to make it work, as we make use of the AI very wisely. Before we move on, please let me introduce three affiliated organizations. First of all, Young Leadership Future Foundation, as a non-profit, sponsors the event, including snacks and drinks. Thank you. Second, Million A+I Startups, as our sister meetup in Palo Alto, California, shares all the meeting contents. Last but not least, AIBrain, as an AI company in both Palo Alto and Seoul, provides with its technology as it has been working on AI for the past 19 years. This meetup is open to any one who wants to build their own business while taking advantage of the upcoming AI revolution. I am Richard Hong Shinn (신홍식), the organizer of Million AI School. 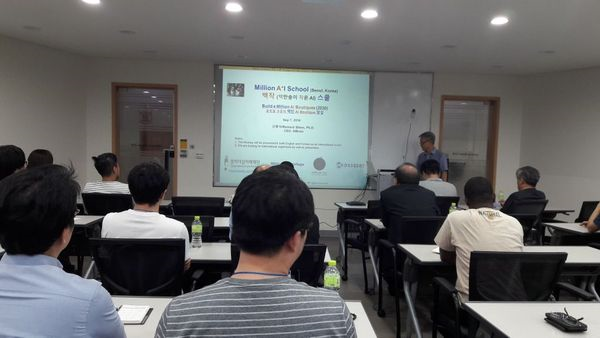 However, the program has been devised in Seoul since the Fall of 2015. The purpose of Million AI School is to share the revolutionary technology of AI for all to help develop a life-long business on their own. We believe every human being, as the greatest creature in the universe, is born with its own unique talent with an almost unlimited potential. If we are able to discover our own hidden talent in a right way, it will be very possible to cultivate one’s own business thanks to advent of this life-changing technology. 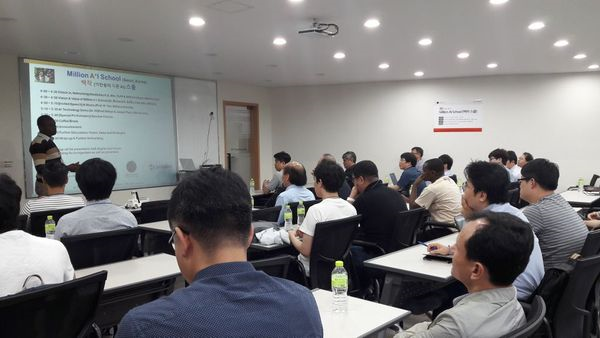 Our program will be presented and delivered in both English and Korean to produce a global quality to bridge the two Million AI events between Seoul and Palo Alto. In this direction, we are looking for co-organizers especially with an international background. · (Video) Why Million AI School? Please join with us this grand challenge. AI 를 통한 평생 기업을 가꾸는 백작 스쿨의 취지에 공감하는 누구나 환영합니다. 그리고 백작스쿨을 함께 운영 할 Co-organizers, Volunteers 를 환영합니다.